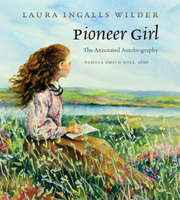 The South Dakota State Historical Society and the History and Heritage Book Club are hosting a discussion of Laura Ingalls Wilder’s “Pioneer Girl: The Annotated Autobiography” at the Cultural Heritage Center and through the video-conferencing Digital Dakota Network (DDN) at 7 p.m. CST on Tuesday, Dec. 16. The program will be broadcast live to DDN sites in Sioux Falls, Rapid City and De Smet. People in other communities may participate at local sites by contacting DDN at (605) 773-3333 or (605) 773-6688. DDN is a video conferencing network. People at the DDN sites will be able to see, hear and talk with Koupal. In “Pioneer Girl,” Wilder describes 16 years of the mostly westward journey that the Ingalls family took from 1869 through 1885. She wrote her memoir of this era in her sixties (1929-30), but the manuscript did not find a publisher at that time. Instead, Wilder’s autobiography formed the basis of her fictional retelling of her life story that has become the essential pioneer saga for millions of readers and TV viewers around the world. The South Dakota Historical Society Press negotiated the privilege of publishing “Pioneer Girl” with the Little House Heritage Trust, which holds the rights to Wilder’s literary works. The book, edited by Pamela Hill Smith, is the result of extensive research and study over four years. “Those reading ‘Pioneer Girl’ will have an opportunity to reconnect with the people and places that Wilder made famous through her fiction, in addition to encountering new ones. We hope people throughout the state will take advantage of this opportunity to learn more about the Pioneer Girl Project and join the December 16 discussion,” said Michael Lewis, president of the South Dakota Historical Society Foundation. As the nonprofit fundraising partner of the South Dakota State Historical Society, the foundation helped raise funds for the publication of “Pioneer Girl.” Donations to the ongoing work of the Pioneer Girl Project can still be made by visiting www.sdhsf.org. Koupal’s talk is co-sponsored by the foundation and the South Dakota Historical Society Press as part of the History and Heritage Book Club. For those wishing to join the discussion at the Cultural Heritage Center, the DDN site in Rapid City is Classroom Building room 109 at the South Dakota School of Mines & Technology. The program will begin at 6 p.m. in Rapid City. The Sioux Falls DDN site is room 145 of the administration building at South Dakota University Center, 4801 N. Career Ave. The De Smet site is the high school/middle school room 119. “Pioneer Girl: The Annotated Autobiography” is available at the Heritage Stores at the Cultural Heritage Center and the Capitol. More information about Wilder’s autobiography can be found at www.pioneergirlproject.org. For more information about the History and Heritage Book Club, call (605) 773-6006.